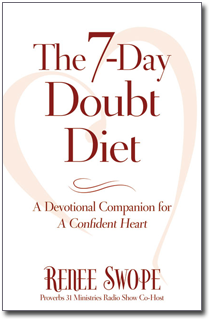 Sign up to receive the free eBook The 7-Day Doubt Diet from Renee Swope. Filled with daily insights, powerful promises, and daily scripture-based prayers, I’ve written a week’s worth of FREE Confident Heart devotions from my book! Do the 7-day Doubt Diet on your own or invite a few friends, co-workers, neighbors or family to join you in your journey of learning to lost the weight of self- doubt and gain the assurance of a confident heart.